It’s really easy to get excited about a last minute trip when your buddy calls and says the fish are biting, and then not take the time to research the logistics of where you’re going to be fishing. Much of the time things work out in the end when we’re doing what we love, but every now and then, no matter how hard you try to make things right, you’re bound to get screwed. That was the case for us during our final day of our recent musky trip with our good friend Charlie Murphy in West Virginia. Due to poor water conditions, we had to go with a Plan B and change our fishing location the final day of our trip. Charlie had taken a friends word that we could launch our boat at the designated spot with no problem. Unfortunately, his acquaintance thought we were launching a drift boat, not a john boat, and that turned out to be and impossible task, without the aid of a cheap pvc roller and a 20 foot section of rope. Now, I’m known for being able to back up a truck and trailer with the best of them and until this day, I was batting a 1000%. 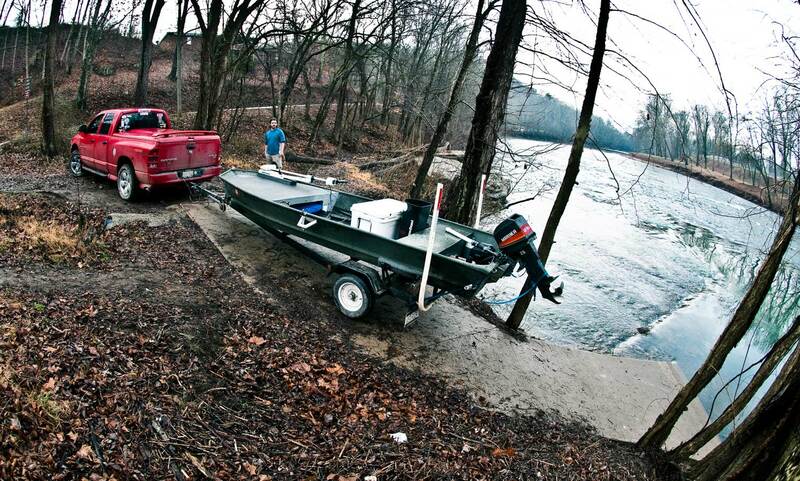 So much for my perfect batting average of backing up, because this midget boat ramp put it to me. I tried like hell, but it just wouldn’t fit. If we would have had the time in our plans to drive by and look at the boat ramp prior to our fishing we could have saved a wasted trip by getting the equipment needed or headed back to our first spot where the musky fishing was super hot. We had nailed them the first couple days but the musky weren’t monsters. Let me give some advice to those that are willing to take it. When it’s your first trip for a new species, don’t leave fish to find bigger fish, because they tend to be much harder to locate and catch. Especially, if you have no idea about the put ins and take outs you’re going to be using and what they look like. To be honest, this was a prime example of being greedy fisherman and getting way ahead of ourselves. What we should have done is pushed away the urge to be greedy and go after big fish for the follow up trip, and instead focused on learning more about tackling our new species on the fly. Taking the time to research and figure out the logistics of your adventure should always be a priority. Let’s face it, if you can’t get on the water, you sure as heck can’t catch fish. I know it’s just a common sense tip today but I thought it would be nice for a change to show everyone some of the background scenes of G&G, and also that we make many of the same dumb mistakes a lot of other fishermen make. In the end, we did do one thing right, and that was taking the time to go visit and fish with one of our best friends. Charlie did a fantastic job of introducing us to musky on the fly. This entry was posted in Fly Fishing Tips & Technique, The Hot Ticket and tagged Charlie Murphy, Fly Fishing, fly fishing blog, fly fishing trip planning, Gink & Gasoline, ginkandgasoline, Kent Klewein, Louis Cahill, musky fishing, Take the Time to Research Your Boat Ramps, trout fishing by Louis Cahill. Bookmark the permalink. Oh man, this is amazing advice. A while back my wife and I had a borrowed drift boat and fell into some last minute babysitting, we did some marginal research and headed to the river. Instead of driving by the takeout we just threw the bike for the shuttle in the boat and put in. Big mistake. The fishing was awesome and multiple steelhead were hooked and landed. Timing was great as we pulled into the takeout with about 1/2 hour of light left to run the shuttle, takeout and head home. Except the takeout was a 70′ slide. As it wasn’t our boat we didn’t have any idea if there was enough rope to reach the end of the slide. There wasn’t. We had about 50 feet. If we used the winch on the trailer we had about another 10 feet. That left us 10 feet short. We found some crappy old rope in our truck and tied it all together, I’m sure you can all guess what happened next, halfway up the slide the rope breaks and the borrowed boat goes flying down the slide back into the river. I have never run so fast in my life. Luckily the rope broke near the top of the slide so there was 50′ still attached to the boat. I wasn’t able to catch the boat, it was starting to meander down the river right into the rapid below the takeout, but I did catch the rope, right at the bottom of the slide. So, yeah, not scouting the takeout ahead of time lead to us almost losing our buddy’s driftboat. Always take the time to scout!